If there is any animal that breaks the rules of evolution in such a way that it could not possibly have evolved, then it would need God as its Creator. The woodpecker is an example of such an animal. The woodpecker's beak is unlike that of other birds. It is designed to hammer its way into the hardest of trees. If the woodpecker evolved, how would it develop its thick, tough beak? Let's suppose some bird decided that there must be all kinds of little critters which would be good for lunch hidden beneath the bark of trees. This bird decided to peck through the bark and into the hardwood tree. On first peck this bird discovered problems with the way it was put together. Its beak shattered when it was slammed against the tree, its tail feathers broke, and it developed a migraine-strength headache. With a shattered beak, the little bird was unable to eat and so it died. Now this bird began to think, "I must evolve a thicker beak and stronger tail feathers and something to help prevent headaches." Of course not. Dead animals can not evolve anything. Yet the woodpecker not only has an industrial-strength beak, it also has a special cartilage between its head and beak to absorb some of the shock from the continuous drumming. Woodpeckers go home at night without a headache. 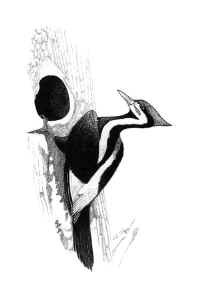 To help with the absorption of the constant pounding, the woodpecker has uniquely resilient tail feathers. It uses its tail feathers and feet to form a tripod effect as it clings to the tree. Even its feet are specially designed to enable it to move up, down, and around, vertical tree trunks. The feet of the woodpecker have two toes in front and two toes in back. Most other birds have three toes in front and one in back. "This two-plus-two toe pattern....along with stiff yet elastic tail feathers, allows a woodpecker to grasp a tree firmly and balance itself on a vertical surface. When the woodpecker braces itself to chisel a hole, the tail feathers bend and spread, buttressing the bird against the rough tree surface. In this way feet and tail form an effective tripod to stabilize the blows of hammering into wood." Suppose that somehow a bird, knowing there was lunch in those trees, developed the strong beak, the shock absorber cartilage between the beak and the skull, the ability to move its head faster than you can tap fingers, the "two-plus-two" feet and the super stiff yet elastic tail feathers. This bird still has a major problem. It will starve to death. How could it drag its lunch out of the little insect tunnels in the tree? Have you ever attempted to drag an insect larva out of a tunnel? They hang on! "...the tongue of a woodpecker is in a class by itself. When chiseling into a tree, the woodpecker will occasionally come across insect tunnels. Its tongue is long and slender and is used to probe these tunnels for insects. The tip is like a spearhead with a number of barbs or hairs pointing rearward. This facilitates securing the insect while transporting it to the beak. A sticky gluelike substance coats the tongue to aid in this process as well." What a fascinating creation! Not only does the woodpecker have little barbs on the tip of its tongue, it is also a mini glue factory. And the glue sticks securely to insects but does not stick to the beak of the woodpecker. Aren't God's creations marvelous! But this is not all. Most birds have a tongue and a beak about the same length. The tongue of the woodpecker has evolutionists scratching their heads. It can be stretched far beyond the tip of the woodpecker's beak as it searches the larval tunnels for food. The animal kingdom displays no other tongues quite like that of the woodpecker. The tongue of some woodpeckers does not come from its throat up into its mouth like other creatures. The European Green woodpecker's tongue goes down the throat, out the back of the neck "...around the back of the skull beneath the skin, and over the top between the eyes, terminating usually just below the eye socket." In some woodpeckers the tongue exits the skull between the eyes and enters the beak through one of the nostrils! How would this evolve? And from what ancestor did the woodpecker inherit its special beak, feet, tail feathers, shock absorbing cartilage, thicker skull and unique tongue? The woodpecker displays the glory of his Creator who is also our Creator. Why would an evolutionist study a marvel of God's creation such as the woodpecker and still refuse to believe in God the Creator? Only one answer seems to make sense! Pride! Pride! Pride! "Rational," humanistic man thinks that he himself is the "...master of his fate and the captain of his soul...." This blinding pride does not allow the intrusion of a personal sovereign God, but rather sees man as the pinnacle of all that is. The time has come for us to humble ourselves and bow before our infinitely righteous Creator! If my people, which are called by my name, shall humble themselves and pray, and seek My face, and turn from their wicked ways; then will I hear from heaven, and will forgive their sin, and will heal their land. Yea, all of you, be subject to one another, and be clothed with humility: for God resisteth the proud, and giveth grace to the humble. Let nothing be done through strife or vainglory; but in lowliness of mind let each esteem the other better than themselves. Lane P. Lester and Raymond G. Bohlin, The Natural Limits to Biological Change (Grand Rapids: Zondervan, 1984), p. 24.